The news is that I, Darci of Stitches & Scissors, have decided to open an Etsy shop! I know I know, everyone is doing it and that is why it has taken me so long but with the encouragement of my family (mainly my husband, thanks babe) and friends I am taking the plunge. I will be making all kinds of things: quilts ( of course), camera straps, girls dresses, skirts, pillows, and some other surprises. I am still in the process of making things to get them listed and when I have enough to list them I will be doing a Grand Opening Giveaway here on the blog to spread the word, hopefully you will help me. I have changed the blog around to add the easy to use tabs bar to help you find all that you need on this site as I expand it. I will be doing alot more tutorial posts so look for those too. Looking for AD space? I have decide to open Stitches & Scissors up to those who wish to advertise. I am excepting sponsors for both image ads and giveaways. Please email me at: darcisews@gmail.com for rates and info if you are interested. My talented awesome brother Devon is designing me a logo. He is a graphic designer and is the perfect person to do it, I have never claimed to be one and I would be terrible at it if I tried :) I will then get labels printed for all the things that I am making, I can't wait! Hopefully I will be up and running in the next 2 weeks or so. I will keep you posted. 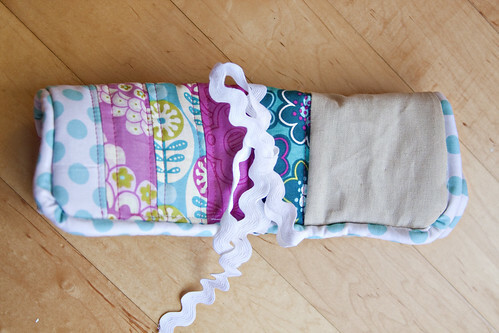 I sewed this Crochet Roll-up case for Charlotte. Her and I are doing a swap. When I receive the crocheted pillow she is making me I will show you pictures, I am so excited. 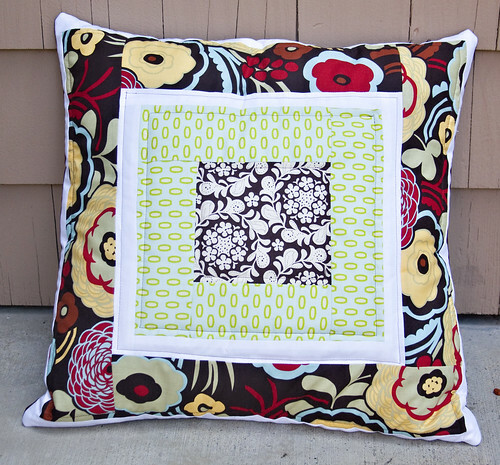 I used some linen as Charlotte said she loved it and then some of my favorite prints. 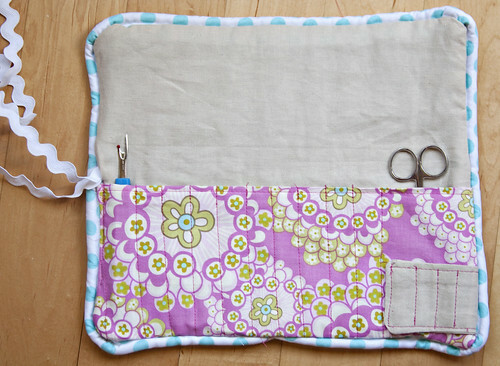 The inside of the case lets you store your needles and it has a space for little scissors and some small pockets for embroidery needles. Then I made my friend Sarah this pillow for her new couch as a thank you for getting our mail for us while we were on vacation. 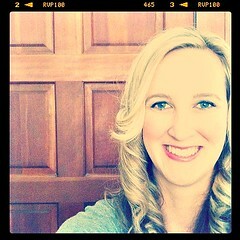 Thanks again Sarah! 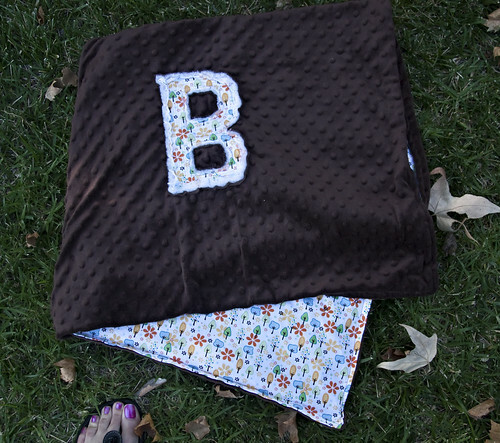 Another friend had her little baby boy, Benjamin, and I made one of my favorite baby gifts the Minky Initial Blanket. I used brown minky fabric and one of my favorite tree prints. I used tons of it in this quilt. 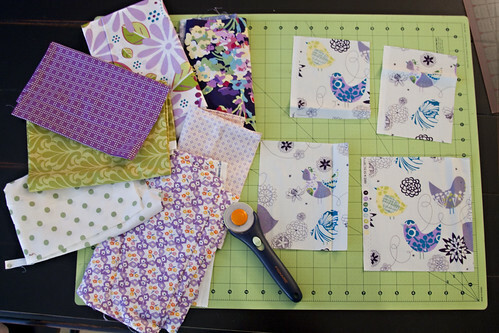 Now I am off to sew a quilt for another friend who is having a baby, here is what I have so far. I am so excited for you and your etsy shop!!! Yahoo!!! And thanks again for the pillow, it looks FABULOUS in our house! and Ah!! the prints for Shalyns quilt look adorable! Cant wait to see it done! you are sooo quick! That's exciting news about your etsy shop. Looking forward to seeing what you will have to sell! I too am in the process of starting an etsy shop. Very exciting but so much to organise! Good luck with it all. So excited. Can't wait to see your etsy items.